Bright reds and dark berries, plus one glorious pink this week, alongside some classic fragrances too. Top left were the gorgeous white flowers of Narciso For Her, which is a fragrance I love a great deal, and could even smell it slightly through my parosmia last year, which always grants a special place in my heart for a fragrance. I wore this on Friday with Mac Hot Tahiti, a soft and gentle red. Bottom Left: I wore Mugler Cologne, which features a little creaminess in amongst the usual neroli and bitter orange that you get in a classic cologne, making this just a little more interesting than the usual plain citrus blast you might get with a sharper cologne. I wore this with It Cosmetics Vitality Lipstick Stain in Pretty Woman, which is a sheer deep berry. I’ll have a lot more to say about It Cosmetics products later on this week. 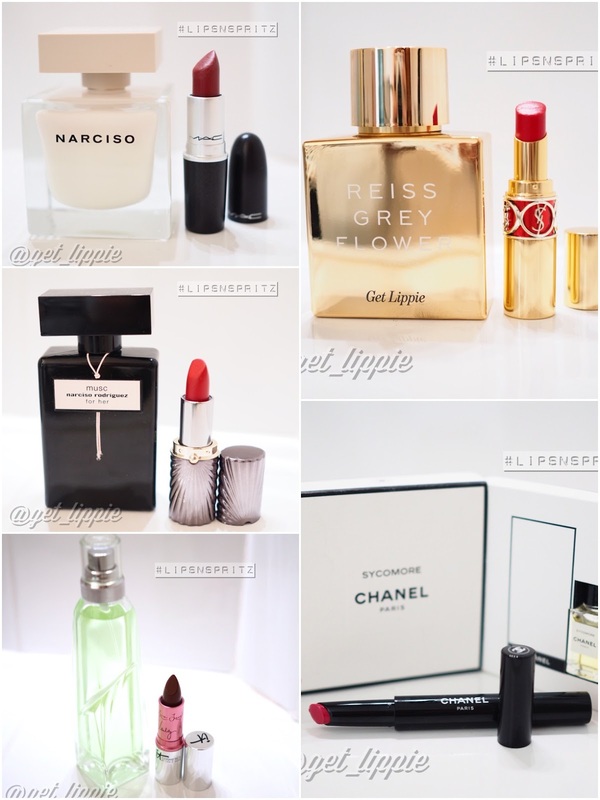 Bottom right is Chanel Rouge Coco Lip Stylo in 208 Roman, which is a beautiful bright pink. I’ve not bought anything from Chanel in AGES, and it’s hard to get across in this picture just how bright, beautiful and juicy these shades are in the flesh. I’ll be picking up some more for sure. I wore it with Chanel Exclusifs Sycomore, which is a fabulous smoky vetiver that I should really pick up a proper bottle of at some point. And finally (top right) Reiss Grey Flower. Still one of the most unusual and haunting fragrances you could buy on the high street for less than £50, it’s filled with guaic wood, which has an oddly fleshy kind of effect (smelled neat, its a bit like parma ham), and this doesn’t smell flowery, either. It’s hard to say what it smells like (apart from good, interesting, unusual), but it’s definitely worth a sniff if you can find a bottle. I paired it up with YSL Rouge Volupte No4, a bright and beautiful sheer red. Not my favourite of formulas – I find it too slippery – but a gorgeous shade. What have your favourite finishing touches been recently?